I name my computers after cats. Not all of them, mind you, and I pick the names carefully. My workhorse servers are Begemot and Matroskin. Today, as I was doing some admin work, I started wondering what I would do if I had to name more machines, given that I'd rather not borrow names from T. S. Eliot. No other fictional Russian feline can match Begemot or Matroskin in their charisma and/or raw satanic power, but for both of them I found a counterpart of sorts: Vasilii from Monday Begins on Saturday (another talking cat), and Leopold, another cartoon character. In the process of looking for fictional Russian cats, I stumbled upon a series of Sergei Alimov's magnificent sketches for a never-produced animation feature based on Master and Margarita. This is, in fact, why I'm writing the post. 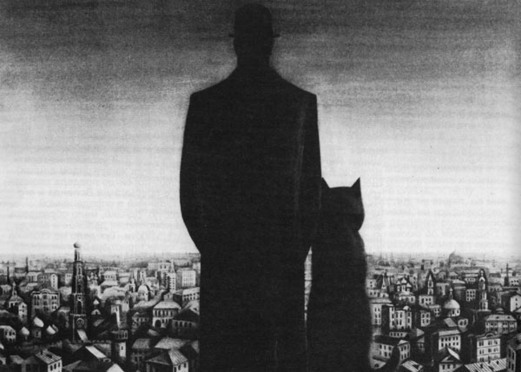 I am very taken with this simple charcoal rendition of Satan and his cat, black silhouettes overlooking the busy landscape of 1930's Moscow, wondering about the inner world of humans inhabiting the gray communal apartments. The rest of the sketches are almost equally great, and convey very well the spirit of the book: at times philosophical, at times irreverent, and always just plain hilarious.